A friend of mine in Spain, someone I am quite fond of would often tell me, at moments of despair. If I was very lucky, I might also get a friendly, encouraging hug. And she was right, as Women often are. It’s a phrase I think about often and recently have tried to focus on more and more. This last leg has had me doubting myself, the journey and my whole reasoning for travelling. It has been VERY tough. Both physically and mentally. More than expected. I have been on the road for a little over 3 months now. And travelled around 2/3rds across the North American continent. This is the longest I have ever continually cycled and I am feeling the exhaustion. But I still want to continue and have a proper rest while visiting my friend in New York. 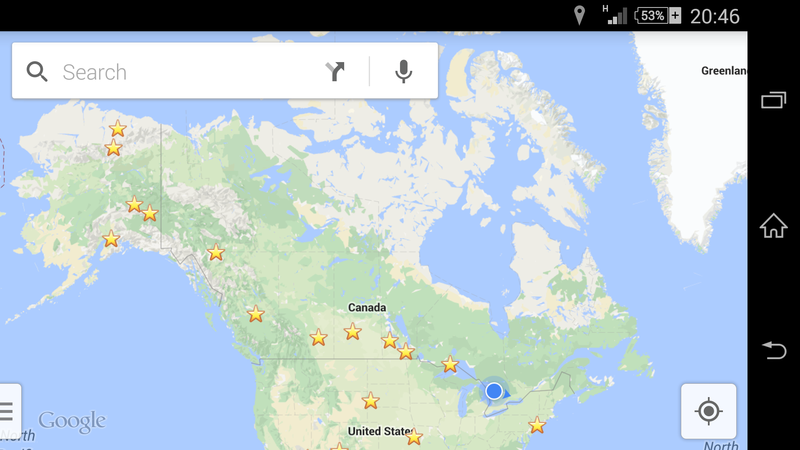 Currently, I am in Sault Ste Marie on the US border with Michigan. I have been tempted to cross here, but I will continue to Toronto as I originally planned. Leaving Winnipeg and the comfortable warm home of Ian and Sheri, I headed directly east. Ian kindly escorted me through the city and we parted ways at the city limits. More or less as soon as he had departed, the headwinds started and remained with me, in one form or another till I arrived at Saulte Ste Marie. As I passed through the Whiteshell national park, the terrain became the distinct rolling, rounded hills left behind by the glaciers of the last ice age. This more or less marked the border with Ontario. My last province in Canada. It would be interesting to see the land with all the top soil removed and just the hills. The remnants of the massive mountains they no doubt once were, now more or less completely cut, scratched and erased by millions of tonnes of ice slowly crushing them to fine sandy dust. The rolling hills and dips in between held water forming many little ponds and lakes with the road winding between them. As I continued, the wind didn't let up. Not strong enough to slow me but enough to sap energy. At my Kenora lakeside campsite, I treated myself to a pizza. Eating about half that evening. The remainder I saved for lunch the following day. I put the box at the end of my tent, not fearing the large bears and coyotes, that inhabit the northern regions. At some point during the night, I was woken by an insistent scratching on my tent. A sharp tap and flashing my torch sent whatever animal it was scurrying away. Skunk INSIDE my tent! Trying to break open the pizza box! Do I scare it off again, and risk being sprayed, or push the pizza box outside and admit defeat? I shouted and fortunately, it turned and ran without leaving its distinct and powerfully smelly signature. Had it sprayed, I think would possibly be looking to purchase a new tent and equipment as it is notoriously difficult to remove the chemical once sprayed. I got off lightly, and from now on, no uncovered food inside the tent!! At Ignace, I stopped at the campsite and met two new cyclists. Bob and Dan. Riding a Bachetta recumbent and a custom Bilenky touring bike. They have spent the past few years travelling across Canada, riding a section at a time during their annual holiday. They were riding as far as Thunder Bay this year. A little later that evening, I bumped into Doug and Jane again. Two cyclists riding cross country who I had previously met at the flood damaged campsite in Roblin, Manitoba. Several days earlier. The following day we all continued independently, but crossed paths several times. By the time I we arrived at Upsala campground we met up again and added Derek to the party. He was travelling east as well, and a strong rider meant he pushed ahead quickly. As I rode towards Thunder bay, I saw Derek on the roadside ahead trying to fix his bike. I saw he had snapped his chain, but wasn't having much luck fixing it. I carry a proper tool. So spent a few minutes repairing the chain and soon he shot off, despite me telling him to take it easy. I arrived in Thunderbay and was treated to two houses. Mark, a friend of Ian from Winnipeg and his young family hosted me for a night and Megan, a warmshowers host, contacted me as well so I stayed a little longer. It was nice seeing the town from different perspectives as well as wandering round myself and exploring. Mark was a teacher who had prevously worked with many Canadian first nations groups and organisations so had a good insight into the problems they face in modern society. We also made a quick visit to the Terry Fox monument on the edge of town. A remarkable survivor of Cancer who went on to try to run across Canada, despite having one prosthetic leg. Sadly, during this run the Cancer returned and took his life but not before he achieved an amazing 5373 kilometres before being forced to finish in Thunder Bay. The annual Terry Fox Run, first held in 1981, has grown to involve millions of participants in over 60 countries and is now the world's largest one-day fundraiser for cancer research; over C$600 million have been raised in his name. I too was in need of a rest. The wind pushing into me was draining and the break in Thunder Bay recharged my batteries. I looked briefly at the possibility of taking a boat accross the lake. To see the lake from a different angle and use an alternate travel method for a change, but many of the boats are small and privately owned. I think it would have been very difficult to persuade someone to take me and a bike across to Sault Ste Marie. Despite moments of beauty as I travelled around the lake, the weather slowly turned for the worse. Everything from bright sunshine to thick cloud, fog and now heavy rain. And that damned wind! I cycled east, north east, north, east again, then south east then south. All around Lake Superior with a headwind from every direction. It never let up! At Nipigon, I managed to camp at the marina for free. Despite the $10 fee that I was told would be collected, nobody asked me for it. I kept cycling. The wind didn't let up. Not strong but enough drain my energy. That and once again the lack of resources along the road. There were a few small convenience stores but most were closed or were poorly stocked or too far off the road. Terrace Bay found me camping for free on the grass in front of the vistor centre. I expected someone to aske me to move, but nobody was concerned. Then the next night in a $25 cheap motel bunkhouse called Gloria's motel and my first shower in 2 nights. I slept well, but woke up with several unexpected bed guests. Several earwigs and woodlice crawled under my bedsheets and were no doubt happily wandering round as I slept! I got up and shook all my clothes freeing 3 more before I dressed, went to the bathroom to find there was no water. "Someone left a valve open, and the water has drained back into the well" proclaimed the owner, somewhat distraught. She was handing out bottled water and soft drinks to a forming queue of customers while the plumber struggled to source the faulty valve. In White River though, a little respite. The sun came out briefly and I was treated to the story of the origins of a famous bear! At Wawa, I bumped into Doug and Jane again and we said we would have to stop saying our goodbyes, as it seemed fated we would meet again. I also received a free pizza from the sympathetic campground owner who took pity on a poor, cold, hungry and very unhappy cyclist. Finally 700 kilometres later, I arrived in "the Soo". Sault St Marie to everyone else. Velorution are a local bike shop and cycling advocacy resource who have a small campground and access to showers and toilets for passing cyclists. It's a simple, free to use but neat setup and though I didn't feel entirely safe, camping behind a huge retail park, I didnt have any problems. And I had an additional rest day here. The first night I was joined by Cristina. A German girl cycling east then the second night by Jason and John who were cycling round Lake Huron to complete a journey they tried and failed the year before, due to mechanical difficulties. This vast area of water is enough to change and create local weather systems and micro climates. The humidity is often high. Winds blow unchecked over the smooth surface and the weather can change dramatically in a matter of minutes. The road is long, steep and winding and though not technically much of a challenge, it is tough due to the other factors. I arrived in the Soo, worn out. And definitely needed a rest day or two. This section has been the toughest so far. People told me it would be the cold Alaskan north slope, or the boring Saskatchewan prairies and yes, they were difficult in their own ways, but this part has seriously had me questioning why I am even here at all.